Breakfast. Dinner. Or Breakfast FOR Dinner. 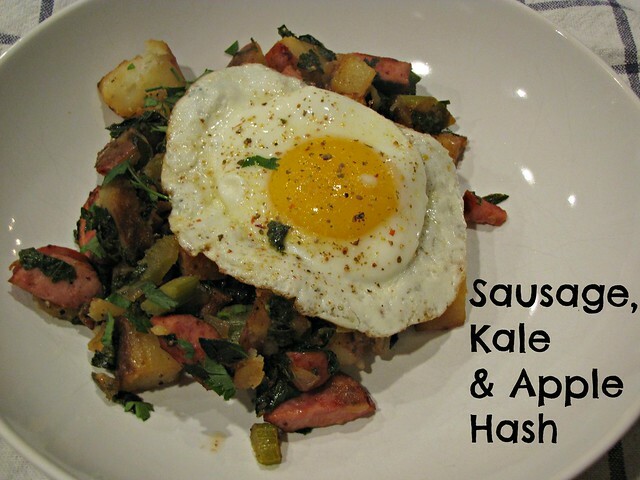 Sausage, Kale & Apple Hash has all those bases covered in a big way. Anything that includes the word hash usually gets my vote. 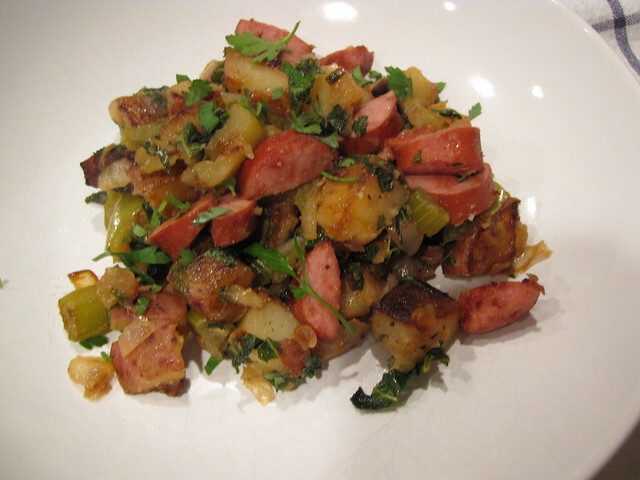 When you start combining good things like smoked sausage, potatoes, apples, and hearty greens it’s hard to go wrong. 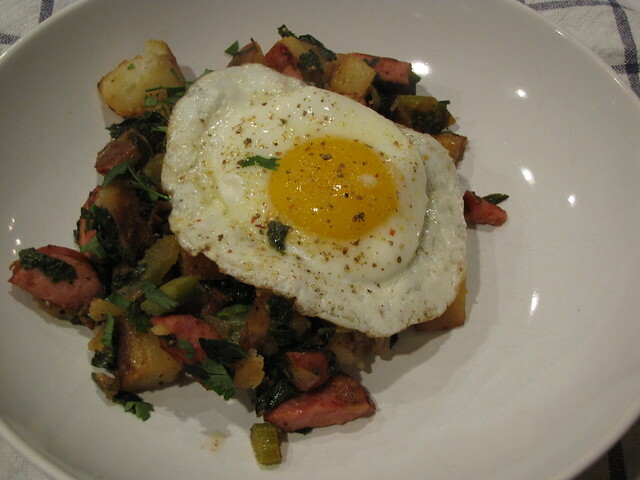 This hash is bold and flavorful enough to stand up on its own. Add a fried egg if you want to take it completely over the top! 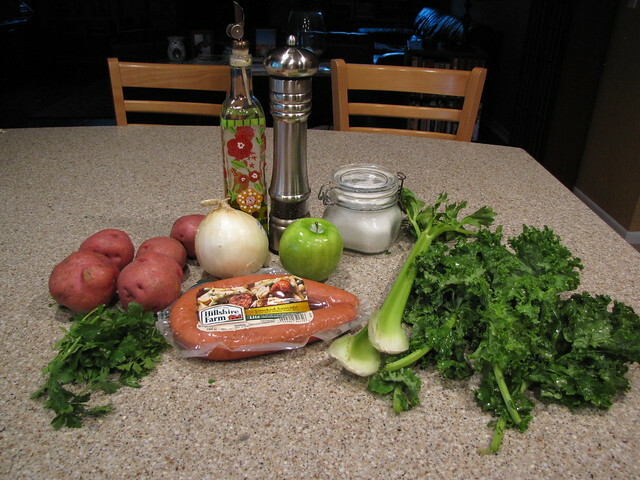 Potatoes, Onion, Apple, Celery, Kale, Parsley, Smoked Sausage, Olive Oil, Cider Vinegar (not pictured), Salt & Pepper. Also, if you are so inclined, 2 eggs to fry. It’s hash which means lots of chopping into small pieces. 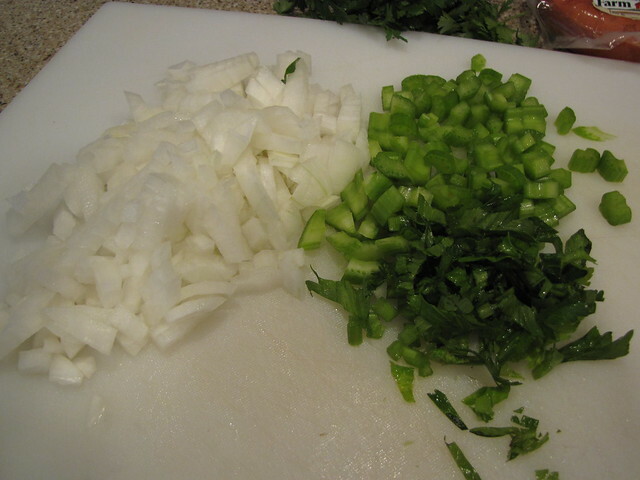 I have 1 medium onion, 2 ribs of celery, and about 1/4 cup of fresh parsley…all finely chopped or diced. 4 or 5 medium red skinned potatoes should do the trick. I leave the skin on for extra color, flavor, and nutrients. Chop or dice the potatoes keeping in mind that the smaller you dice them the faster they will cook. 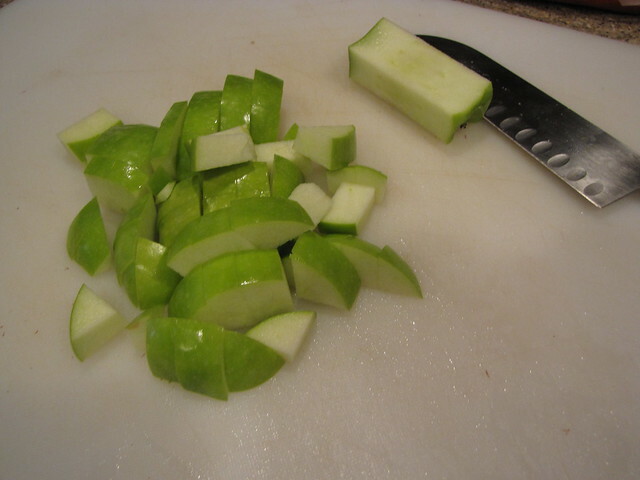 I also have 1 Granny Smith apple. Again, I’ve left the peel on but if you want it to be softer when it cooks, you might remove the peel. Any nice, firm, flavorful apple will do. 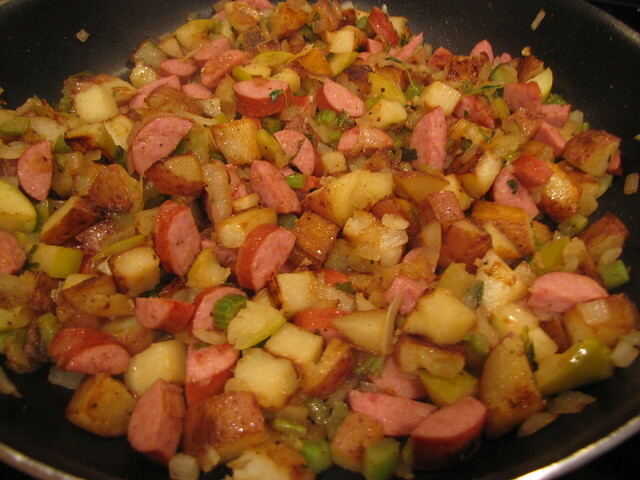 Choose a very large skillet that can accommodate all of the ingredients. 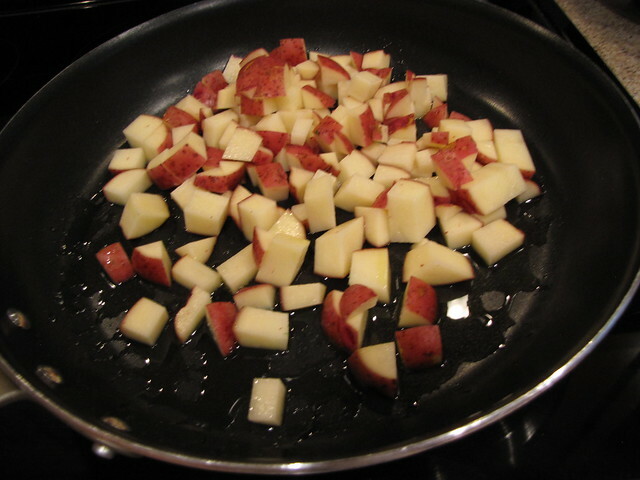 Heat 2 Tablespoons of olive oil over medium high heat and add the diced potatoes to the pan. 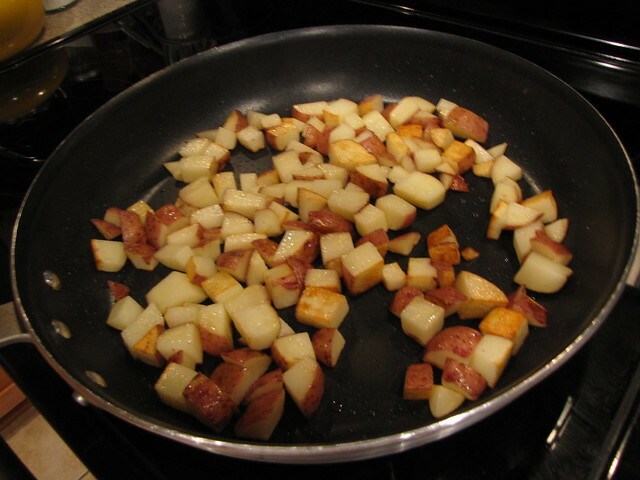 Give them a quick toss to coat the potatoes on all sides with the oil, then let them cook until they are golden brown, about 10-12 minutes. Stir occasionally to rotate them in the pan and so they won’t stick. 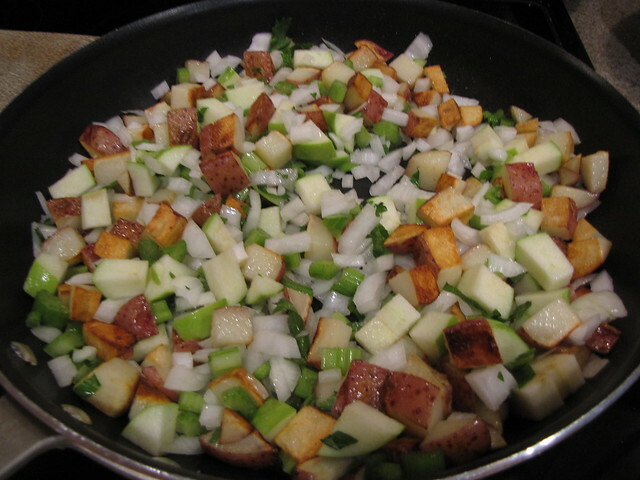 When the potatoes are mostly golden brown, add the chopped onions, celery, and apple to the pan. Season with salt & pepper and cook until the tender, about 10 minutes. Note: Because my potato pieces were a bit larger, I covered my pan with a lid for part of the cooking time to get the potatoes to soften quicker. 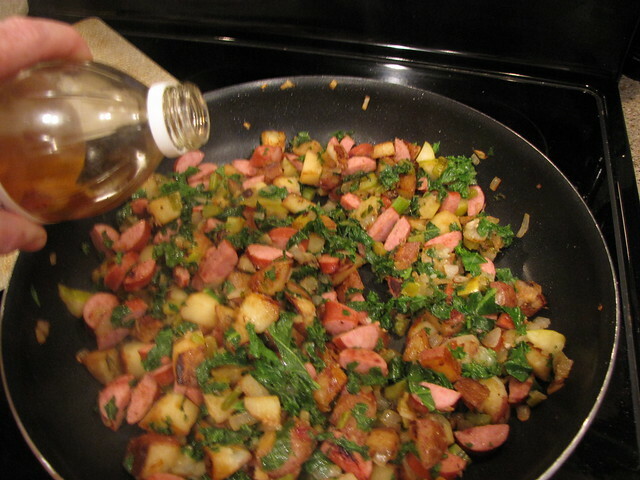 While the veggies continue to cook, cut 1 pound of smoked sausage into half rounds. I’m using light sausage which is made with some turkey meat. 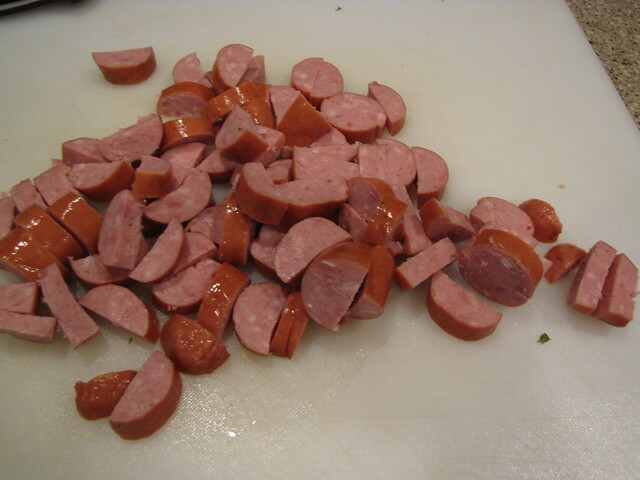 You can use the all-pork variety or any good smoked sausage or kielbasa. 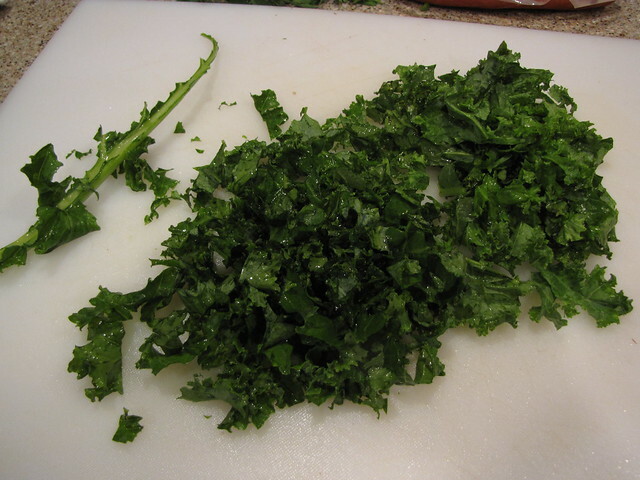 Strip the leaves away from the stems of 4 large kale leaves. 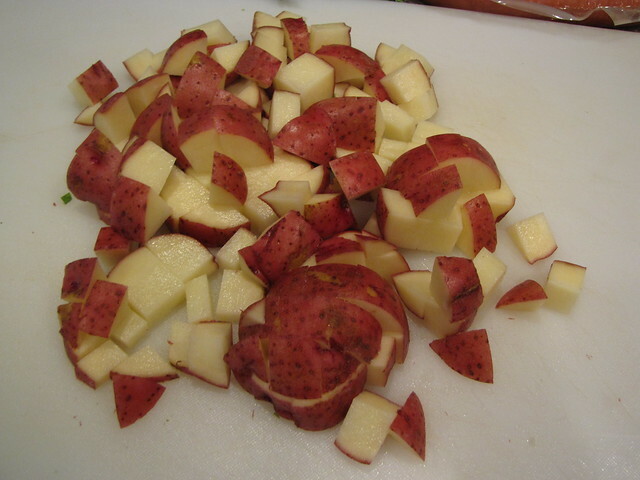 Discard the tough stems and finely chop the leaves. 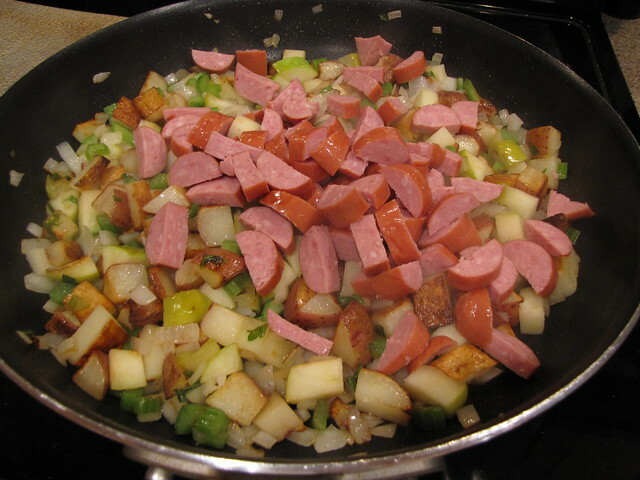 Add the smoked sausage to the pan and stir to combine. Cook until the sausage also begins to get some golden color on each side, about 10 minutes. Add the chopped kale and stir until it starts to wilt. Stir in 1-2 Tablespoons of apple cider vinegar. The vinegar really helps to pep up the flavors and bring the whole dish together. Adjust the seasoning of salt & pepper to suit your own taste. 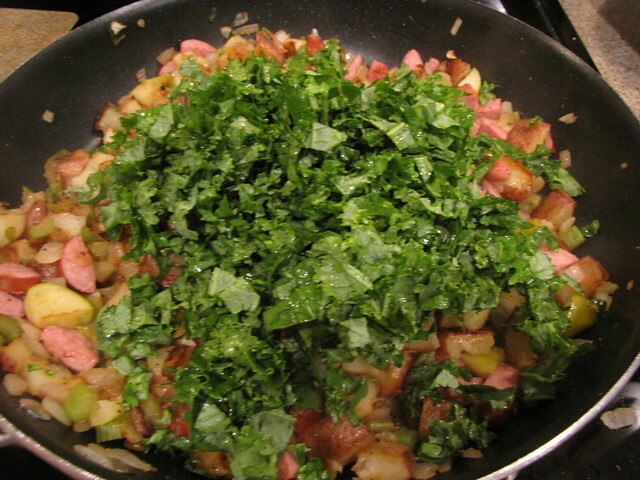 Spoon into a bowl and top with some fresh chopped parsley. You can certainly eat the hash on its own (like I did) but to really take things to a whole other level, quickly fry an egg in a little butter, salt & pepper. Plop that baby warm and slightly wiggly right on top of the hash. I can’t have eggs and I can honestly tell you that I have never been more jealous of Jim’s plate. This looked SO good with the yolk mixing into the hash. We had this for dinner but I’m definitely making Sausage, Kale & Apple Hash (with eggs) for brunch the next time my family is in town. I don’t know how I’ve lived my life without you until now, but I will never be without you again. This looks so darn good. The husband had something like this recently at our new favorite restaurant….I’ll have to try this myself! This sounds great, I’m going to try this with soy sage (veggie sausage substitute).